A quite interestingly coloured snake that can be found here in South East Queensland. 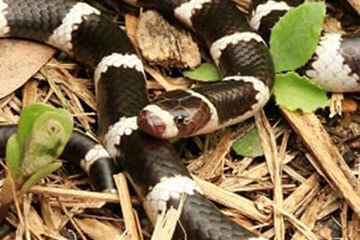 This snake is known to feed exclusively on the ‘Blind Snake’, and displays similarly nocturnal habits. These snakes are not known to pose a threat to people and bites rarely occur, however they may mimic the ‘Stephens Banded Snake’ in appearance, which is highly venomous. When disturbed, the Bandy Bandy bends its’ body into a series of raises ‘loops’. After each breeding season pregnant females give birth to approximately 8 eggs.